It has been estimated that between 5 and 10 percent of the world’s population suffers from food allergies, and the consensus among medical professionals is that these numbers are still growing. Out of every classroom in America, there are at least two teens who have food allergies, and every three minutes someone is taken to the emergency room as a result of an allergic reaction. From school cafeterias to movie theaters to sporting arenas—not to mention restaurants—teens encounter countless allergens. Although parents and health professionals are on the alert for food allergies, teens themselves must take the steps needed to ensure their health and well-being. But most of the books about food allergies are aimed at adults and don’t take into consideration the perils that face teens on a daily basis. Jessica Reino is a paralegal and author. She is a member of the Society of Children’s Book Writers and Illustrators, Asthma and Allergy Foundation of America New England Chapter, and a member of Food Allergy Research and Education. Chapter One – What Are Food Allergies and Why Should You Care About Them? Chapter Four – Friend or Frienemy? Chapter Eight- Dining In or Out? Over the last several decades, the world has seen an increase in food sensitivity. 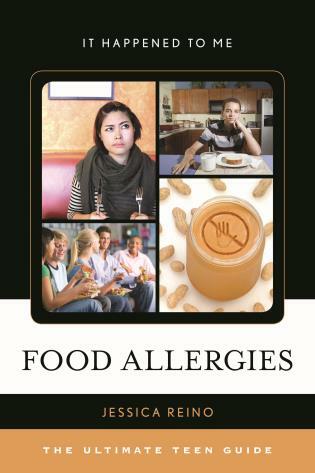 This book addresses the cause of allergies, delving into the catalysts that provoke physical reactions; but more importantly, it stresses what teens can do to prevent such incidents. With a chapter that contains a few allergy-friendly recipes, Food Allergies: The Ultimate Teen Guide is an invaluable resource for young adults, their friends, and their families.